La villa est idéalement situé à seulement 20 minutes de Malaga et à 25 minutes de Marbella et de ses plages. A proximité d'une variété de bars, des restaurants et des commodités. La villa a été construite par ses propriétaires et achevée en 2006 - il a été fini à un niveau très élevé et est situé dans l'exclusif urbanisation Sierra Gorda et commandes une vue imprenable sur les montagnes et le village de Coin. Etre face à l'ouest, il obtient les meilleurs couchers de soleil. Salle de bains attenante à la chambre 1 avec baignoire, douche séparée, wc. Salle de bains 2 grande douche de style wetroom, wc. wc extérieur. Notes sur le logement: La propriété est adaptée pour les familles avec de jeunes enfants. Air conditionné / chauffage dans toute. Wifi gratuit est maintenant inclus. À l'extérieur: patio de bonne taille et privée de 8m x piscine de 4m douche avec jardin tropical et caractéristique de l'eau, des transats, des chaises longues, table et chaises, cuisine extérieure et un espace barbecue, wc extérieur. terrasse sur le toit avec la ligne de lavage rotative. Service de nettoyage / serviettes / / Femme de ménage: Les serviettes et les draps sont fournis et seront changés une fois par semaine. Autre: Terrasse couverte est un endroit ombragé où vous pourrez déguster un repas ou tout simplement se détendre et profiter de la vue. 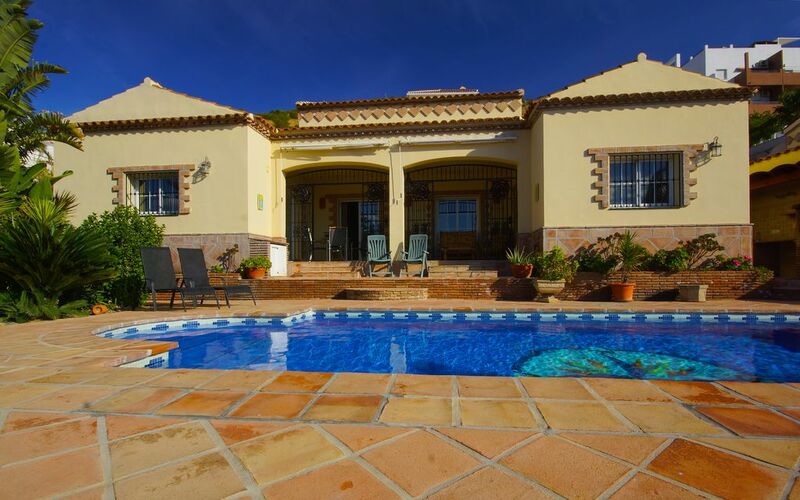 Fantastic villa, very spacious for 5 adults and beautifully maintained. Had a lovely stay in Coin. It is well placed between Malaga and Marbella. Micky's pub about 10 mins walk, we had gluten-free and vegan in our party and they were able to produce meals for them. Also tried the Chinese in Coin, very good value and excellent service. Shame we were there only a week, would have loved to stay longer. Fantastic Villa, very clean and well equipped. Would definitely return. Property was a good size, nicely decorated, had all we needed and for us was ideally located having a hire car being within around 30 minute drives to most places of interest. We stayed in this delightful villa for a family vacation from 1st to 7th of September 2018. First up, Katie was a perfect host - excellent communication and very helpful. The instructions were spot on to find the villa which is not difficult, about 40 minutes from Malaga airport. On arrival to the villa we got the keys no problem, and on entry found the villa spotlessly clean, well appointed and with all the essentials you could need - towels, loo roll, basic condiments etc. The villa itself is spacious, and the photos online do not do that justice. Views very nice over the mountains. The pool is superb, and south facing so has the sun all day. Outside area is again spacious, and very well appointed with outdoor seating area, barbecue and outdoor loo, shower, sun loungers and table. There is also a veranda with sofa and dining no table, so perfect for the evenings. Games, books and DVDs provided as well, which was a lovely touch. There is an informtion pack which was extensive too, with lots of information about the surrounding area. Coín itself is well appointed with several large supermarkets, restaurants etc. We have been in the area before and apart from a trip to Mijas, we didn’t want to go out and about much. The villa was perfect that we all had enough space (my wife and I and my mother in law). We wouldn’t hesitate to return here, not a single fault with the entire experience and it is clear that Kate’s high star rating is well warranted. She has thought of everything! Thanks for having us and will be back. Outstanding villa with everything you could need for relaxing holiday. Third time at this villa and wouldn't want to stay anywhere else. It is immaculately clean with a linen change every week and loveable Des who comes to look after the pool. Standards are very high at this villa and there is now two supermarkets open just down the road and a fabulous Restaurant that does a mean English Breakfast and a superb selection of meals including things the fussy children will like. Couldn't ask for a more luxurious place to stay. We will be back next year. Thank you Kate and the gang for looking after us. 20 minutes de l'aéroport de Malaga. 5 minutes en voiture le village de la distance Coin. 10 minutes village Alhaurin El Grande. Centre commercial La Troch est situé à 5 minutes et il ya 2 bars / restaurants à distance de marche. Booking Notes: Arrival day is flexible (Saturday only July/August). Prices are inclusive of electricity, water and heating a deposit of £130 per week booked is required at time of booking and the balance is due 8 weeks prior to arrival. Sorry no pets.